There is a frequently unrecognized, though insidious perspective concerning improvements of all sorts. It is the expectation that they will be accomplished in one plan-do-check-adjust cycle. The “Helix” is my answer to the “instant perfection” expectation. 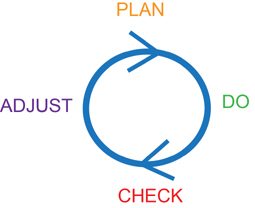 Writing the PDCA cycle on a flat sheet or flat surface, with the expectation of it being “perfect in one-shot” freezes organizations, departments, and individuals. On the one hand, the “P” at the top of this cycle stands for “Plan Forever”: this plan will never actually be implemented because the risk of not being perfect is too high. Or, on the other hand, the “P” at the top of the cycle could stand for “perfect”, in which case you never look at it again. Both of these conditions are dangerous because the organization that does not figure out how to repeatedly apply improvement projects to its core constraints will eventually be passed up by a competitor who has figured it out! By the time that happens, the non-iterating organization will not know what hit it. The managers and staff will all blame something besides the lack of continuous improvement… probably internal politics! 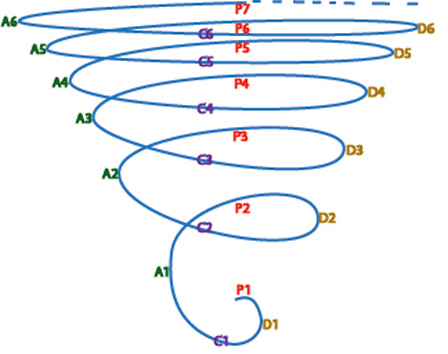 However, instead of portraying this path as proceeding around the perimeter of a vertical cylinder, with an equal radius throughout, it can more accurately and more appropriately be portrayed as starting with a smaller radius at the bottom and proceeding up to a wider top: like a PDCA tornado. Rewriting, or in other words re-portraying this cycle as a vertical Helix, especially in the form of a tornado, accomplishes a couple of critical things. First, it eliminates the expectation of one-shot perfection, which takes the unrealistic perception of risk away from organizations, departments, and individuals, so they are able to use their actual current abilities to advance the standing of their organization. Secondly, the performance expectation shifts from “perfect-in-one-shot” to “take your best shot… quickly!” The speed between cycles without the expectation of instant perfection is what drives the tornado! Absent the “Instant Perfection” expectation the improvement cycle iterations behave like a tornado instead of like an arduous process. 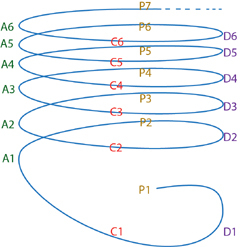 It is not accidental that these Helix’s are presented with 6 iterations. It typically takes between 4 and 6 trips around the PDCA cycle for a system to move from chaos to a self-sustaining system – to move from expedited, backflow (or non-flow) , and chaos to smoothly flowing, no backflows, everyone-knows-what-is-expected-of-them-and-has-the-tools-to-do-it smoothness. So, what is meant by “way too much?” Do they mean the months and years of being regularly interrupted, typically on an emergency basis, by a system that really doesn’t work? The expectation of “perfect in one-shot” is exactly what has perpetuated this ill-begotten system, which is a pain in the neck to everybody that deals with it! On the other hand, running tornado-like PDCA cycle’s to eliminate the underlying causes and miscommunication involved in this system will make everybody’s life much less hassle and probably make the organization more profitable, or at least more productive. And what is more, you will be able to see this happen right before your eyes with each progressing cycle! In addition, it will take a lot less time and hassle to improve this system than it has taken to baby sit it for the last x-number of years. You may also be interested in my version of the Strategic CPI (SCPI) rendition of this cycle. A final note: if after you have developed and presented an improvement plan, you frequently encounter the response, “Yeah… but…“, you may be interested in the article by that name!